Tracheal collapse is a chronic disease involving the trachea (windpipe) and lower airway. This disease is progressive, meaning it gets worse over time. Although tracheal collapse is irreversible, there are treatments available. The trachea is a major part of the airway. It is a flexible tube-shaped structure that is surrounded by u-shaped rings of cartilage. These rings are attached to a membrane and help keep the trachea open, allowing the dog to breathe normally. If these cartilage rings become weak or worn, they may no longer be able to hold the trachea open. They flatten and collapse the tube, shrinking the space through which air can pass. The tracheal collapse may also involve the lower airway, where smaller tubes (mainstem bronchi) carry air to the lungs. Small dog breeds are most commonly affected by the tracheal collapse, especially Pomeranians, Yorkshire Terriers, Chihuahuas, Maltese, and Papillons. Collapsing trachea may or may not be hereditary. It may be congenital (present at birth) or acquired (developed later, sometimes secondary to other diseases). Overweight or obese dogs have a higher risk of developing tracheal collapse. Exposure to cigarette smoke or other air pollution may worsen tracheal collapse. Be sure to report these and any other signs of illness to your veterinarian. Waiting can only make the disease progress to the point where your dog's life is in danger. It's better to act early just in case. If you suspect your dog has a collapsing trachea, be sure to visit a veterinarian for an evaluation. Your vet will begin by asking several questions in order to get some history about your dog and the signs you have noticed. 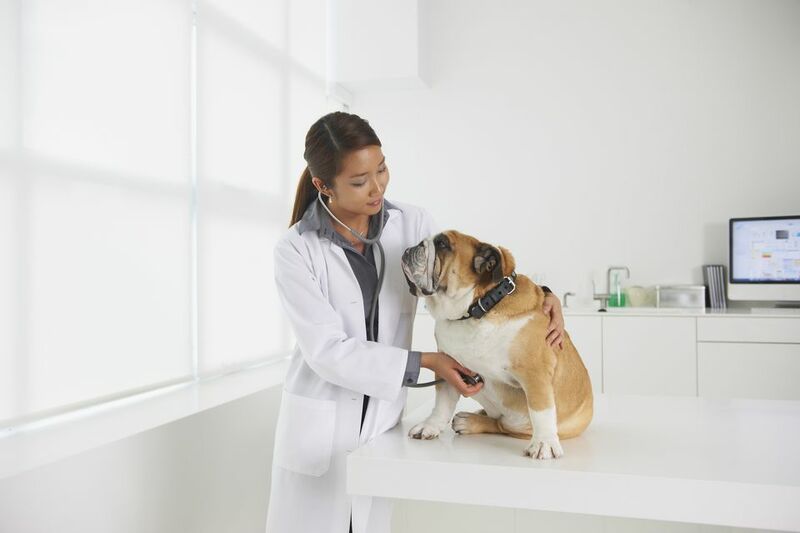 Then, your vet will perform a physical examination on your dog. Your vet may try to elicit a cough by putting a bit of pressure on the trachea. This is not an actual determination of the disease, but it can give your vet an idea of the type of a cough your dog is experiencing. If you have a good video of your dog coughing, wheezing, or exhibiting other signs, it may be helpful to show it to your vet. Next, your vet will most likely recommend radiographs (x-rays) of the chest. This will show a radiographic view of your dog's airway, heart, and lungs. Tracheal collapse may not show up on the x-rays, especially in minor cases. The x-rays may even reveal a completely different cause for your dog's symptoms. There is a good chance your vet will want to do lab work to get a better idea of your dog's overall health. Lab work may reveal underlying conditions that contribute to the tracheal collapse or are unrelated. Lab results may point to another condition that is causing your dog's signs. Endoscopy, during which a tube-like fiber optic camera is inserted into the trachea, allowing the veterinarian to see the inside of the trachea and take fluid samples for culture and analysis (all with your dog under anesthesia). Based on the outcome of the above testing, your vet will hopefully be able to make a diagnosis. The next step is to begin treatment. Tracheal collapse cannot be cured, but there are several ways to help your dog. First, be sure to stop using neck collars on your dog, Switch to a harness that does not put any pressure on your dog's neck area. If your dog is overweight, your vet will recommend a weight loss program. There are several medications that can help alleviate the symptoms of tracheal collapse. Cough suppressants are most commonly prescribed (such as hydrocodone). Sedatives may also be prescribed to reduce anxiety and keep your dog calm and relaxed (less excitable and therefore less likely to cough or have tracheal spasms). Be sure not to use any over-the-counter medications unless specifically recommended by your vet. Use all medications according to your vet's instructions and do not change doses without consulting with your vet. Avoid so-called "home remedies or "natural remedies" unless your vet says they are safe to try. Unfortunately, some can make things worse. Medical management is effective in the majority of dogs. However, in severe cases, surgery might be the best option. Surgical treatment of tracheal collapse is a major procedure that must be performed by a veterinary surgeon (ideally ACVS board-certified). Surgery may involve the placement of special plastic rings around the trachea. Or, the surgeon may need to place a stent inside the trachea or lower airway (a mesh device that holds open the airway. In some cases, the stent can be placed by a veterinary or internist (ideally ACVIM board-certified internist) via tracheobronchosopy. Although there are several risks associated with airway surgery, many dogs recover well with proper medical care. In some cases. the stent or plastic rings may break or become displaced. This is why it's so important to follow your vet's recommendations and report any signs of illness. A post-operative hospital stay of one to two days is typical. Medical management is usually continued during the recovery period to decrease pain, swelling, coughing, and excitement. As with most surgical procedures, the dog's activity must be restricted during the recovery period and follow-up visits to your vet or specialist will be necessary. After recovery, some dogs will continue to exhibit signs, especially coughing. Fortunately, these signs are usually much milder. usually much milder. The good news is, with proper care, most dogs can live relatively normal lives despite tracheal collapse. As always, be sure to communicate with your vet, asking questions and providing updates on your dog's condition.